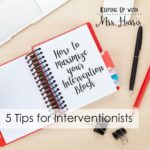 Four years ago when I took a leap of faith into an intervention position, I realized how few resources there were out there for reading and phonics intervention groups. I read SO many books about developmentally appropriate phonics and how to go through the proper foundational steps in order for students to master phonics and not just memorize rules and strategies. 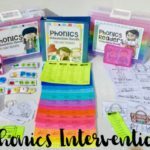 After four years of being in the intervention classroom and/or intervention coordinator for my district, I feel that I can identify and fill phonics gaps for struggling learners. 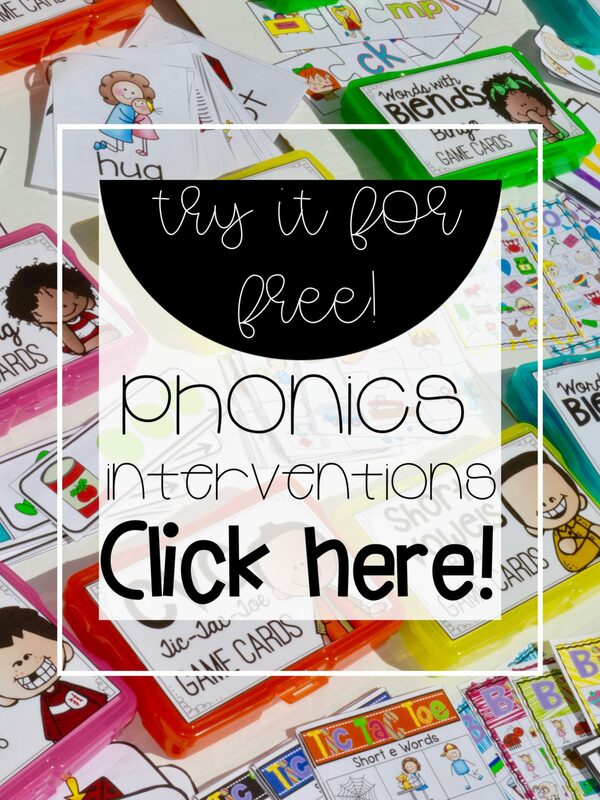 I’m by no means an expert and have lots more to learn, but I’m excited to share some of my favorite phonics resources with you. CLICK HERE TO GO AHEAD AND DOWNLOAD THE FREE SAMPLE! There is a natural order to teaching phonics that we are all probably pretty familiar with. You might have kindergarteners ready for CVCE words and second graders still working on words with blends. The range of phonics abilities in your classroom with vary quite a bit from year to year and group to group. Just remember that they can’t move to the next developmental phonics stage until they have mastered all the prior ones. Don’t skip and constantly review. I’ve worked for months compiling the activities that I have used the past six years in my second grade and intervention classroom to share with all of you. Every time I started though, I became very overwhelmed and never finished. However, I’m happy to say that I finally did it! I am officially ready to share it all with you and even share a huge free download for you to use in your classrooms. Want to purchase the plastic boxes? Click here to take a look! I don’t know about you, but organizing all these of pieces is KEY in my classroom. I need to know where everything is at all times! Seriously! Don’t put those cards in the wrong place! Here’s another look at how I double labeled these boxes so outside and inside both match. Gosh darn it! Who hates teaching /dr/ and /gr/ blends??? I DO! Kids have such a hard time segmenting to spell these two. Yes, students tend to be able to read and blend them fine, but segmenting is a whole different story! I’ve incorporated several of the same type activities to really create a sense of empowerment and confidence with our students. When students know the expectation and feel confident in the process, they will achieve greater success. Here are the activities that are included that focus on words with blends. There are only three long vowel pattern activities because very few intervention phonics groups master this skill in the younger grades. However, they are very important for second graders, so I plan on adding more to this pack very soon to focus on upper phonics. 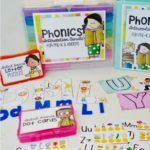 With all phonics instruction, you need printables to reinforce and provide additional independent or small group guided practice. I’ve included 10 different printables that you can use with ANY word list! YES! You can add whatever words you need to focus on for that particular week. Just type and print! Roll out Playdough words or add a little stamp it out fun! Type, print, and go! 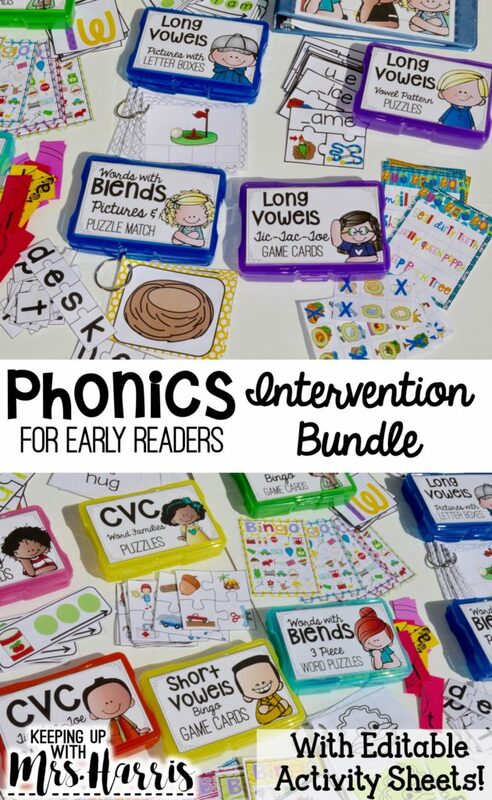 Twenty different word family phonics readers and fluency strips have been added to the bundle to ensure that your students are applying those phonics skills! 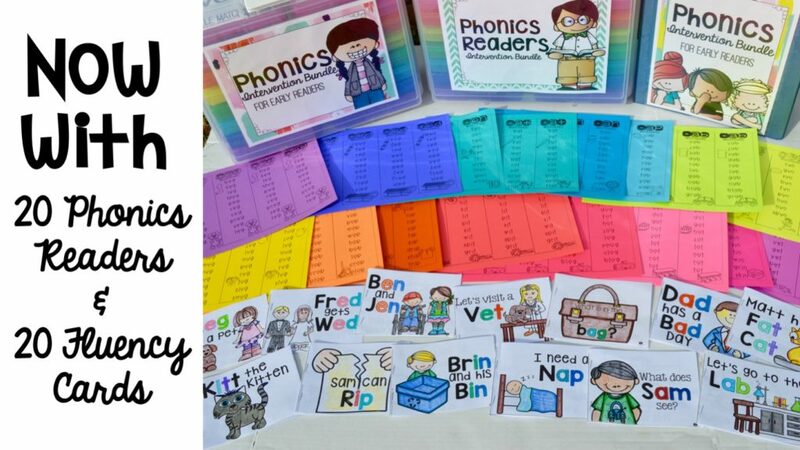 Make fluency and comprehension a priority while teaching phonics. Don’t stress! I’ve made it simple. 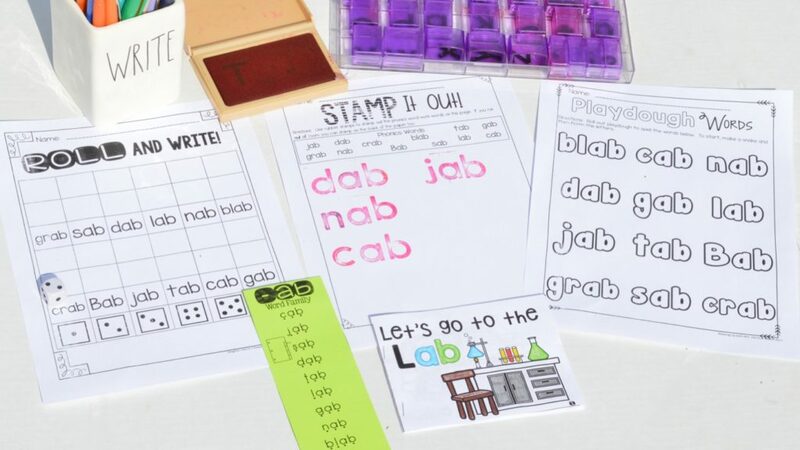 Pull activities from your kit to match the readers and the fluency strips can be used at home for additional word practice or as small group warm-ups. There is so much more to be added to this bundle. As it grows, you will be notified of all the awesome additions and how you can use these strategies in your classroom. Best news ever? Because I want your students to get their hands on these hands-on materials TODAY, I’m offering you a special promo price! The price will slowly increase over time as more content is added. By purchasing today, you will get all future updates for FREE! CLICK HERE TO DOWNLOAD A FREE SAMPLE OF THE BUNDLE NOW! P.S. This post contains a few affiliate links to Amazon. While they make the big bucks, they send a few pennies my way when purchases are made using these links to help with the up keep of this site. 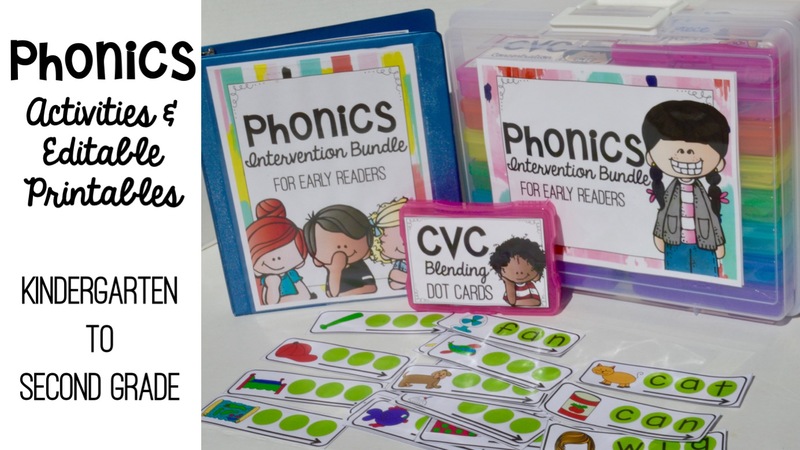 Which Phonics Bundle is the Right Fit? 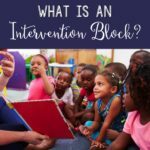 What is an Intervention Block? I am so excited to use this in my classroom. I watched the videos and had to have it! I am a Kindergarten teacher moving to 2nd grade next year. I love it even more because I can use it this year with my Kinders AND next year as I move grades!! Thanks so much! Michael’s! They are $15.99 this week too! What is the organizer called? I’m looking but not seeing it. The videos on facebook were wonderful. It let me really see what was included and how to store and use. Thank you for the freeby. So sorry! I think it is working now! Thank you so much for the great product! I purchased the bundle last week and this weekend I got the plastic container along with the boxes at Michael’s for $15.99!!! This is amazing and can’t wait to get everything laminated! One question is – for the skills do you ever have more than 6 students in a group? I find that sometimes with certain skills during our intervention time I might be working with more than 6 and wondering how to use these “boxes” for the certain skill and not having enough materials for the student. For example with the Tic-Tac-Toe game only 4 cards are available. Just wondering how you handle this. Many thanks and looking forward to seeing more neat activities!!! I vary my groups but tend to stick with 6 or less. For Tic Tac Toe, two kids are playing the same card with one being o and the other x. So there’s enough for 8. I tried to make sure that there was at least enough materials for 6. However, some would be perfect for less or more (Go Fish). Feel free to email me at keepingupwithmrsharris@gmail.com if you have other questions. Thanks for your purchase!! I’m uploading two more games tonight so be ready to download sometime tomorrow! This looks great! I also love the way you have it organized. Do the title cards come with the purchased bundle or with the free download? Thanks for sharing! They are with the purchased bundle. I didn’t really know if anyone would be interested in those with the free download or if it would be a waste of ink. Hi~. This is great. I want to try it, but I am not able to find the download. I entered my email, but it is not taking me to it. Where did you get the little loose letters – the blue ones? Thanks for all of your work on this! Beautiful products! I know kids will love them. Is this a good thing to have at home to start little ones reading early? Or is it really more suited for teachers? 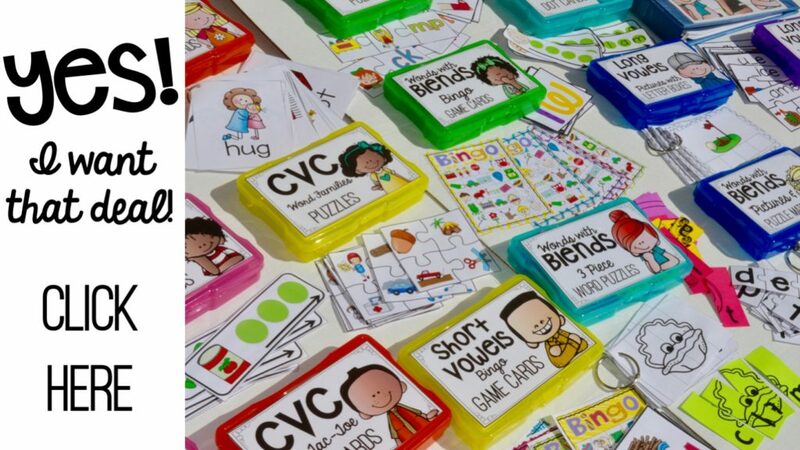 We clearly wouldn’t need multiples of each card since it would only be the little guy and I.
I just purchased the Phonics intervention for pre-k and k…. I have am fixing to purchase the next set but want to make sure I get the right one. You gave a free assessment on your fb page. I gave the assessment to the child he knows all letter A-Z and their sounds. He knew all 5 initial sounds but only knew 1 of each on the vowel sound and ending sounds. Which would explain a few things… Here is my question which bundle will I need to get to help him? On teachers pay teachers I only see the pre-k and K and the independent reader…. is there a 3rd kit that would cover him? Hi, I purchased the bundle in June. I have not used it yet. I am looking forward to implementing the bundle. I am getting ready to print and do not see the cards with the yellow dots. I am new to downloading items from TPT and need help. I have searched and can not find what I thought I purchased. Please help. Hi there. I purchased this bundle and I’m so excited to use it. I was making the CVC Tic-Tac-Toe and noticed that with the short i x’s and o’s there may have been an error. I went back to check but still found I was missing a set for “sit”. I had an extra set of “six” though. I watched the video where you were describing the CVC and didn’t see how you had the x’s and o’s stored in the box. Am I missing something? I put each vowel in a snack size baggie but it barely fits in the box. Can you explain that to me? I love this product. Thank you for taking the time to create it and share it. How do you attach the covers to the boxes? I wasn’t sure if you used packing tape or something else! I laminate the covers and then use high temp hot glue to attach them. Hello! I just bought your kit and am having such a fun time putting it together — I can’t wait to get started using it in my classroom! I was wondering if you have a blog post or instructions about how you organized the early readers! I love them, but wasn’t sure if they are a whole separate kit. 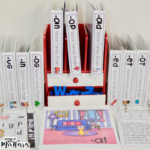 Do you keep the readers and fluency cards in a separate organizer together? Thank you for this amazing resource! 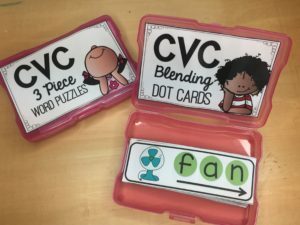 Also, I was wondering what you use the cvc picture cards and words with blends picture cards for … I can’t find any info about them in the packet! Thank you again! I use the cards for word sorts. For example, we can do word families and rhyming words. Find all the words that rhyme with run. Or find all of the short o words. Looks awesome!!! I would love a freebie sample, I teach kindergarten! Where do you find the letter pebbles? I am a volunteer teacher of deaf children. 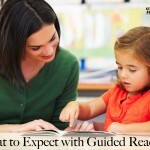 I have retired but am helping children with remedial reading. This looks so exciting and I am sure it will be useful. I live in South Africa. How do I get the bundle? when I click on freebie it asks me to put my first name and email., then says thanks all done, but no link to download. Check your email. You should receive a link. Can’t wait to try out your products! I am unable to download the free sample. I put in my name and email and all I get is a page saying thank you but with no link to the pages or ability to download the sample. I have a few extra shoeboxes in my classroom to toss extra pieces in so that kiddos don’t get overwhelmed. For the readers, I use an index card holder. I put the fluency strips on o-RIngs and hang up. I sure hope this helps you! Enjoy and thank you for your sweet message! We’ve used so many of the activities in the first three weeks already. I have filled out the email and I have not received the download. Please let me know what else I need to do to make this work. I work as a reading teacher and a dyslexic pull out teacher and this would be a great aid, but it just keeps asking for my email address and then when I go to my email, I don’t have anything from you to download. Thank you for your help. I am overwhelmed at all of my choices. I teach 3rd grade, but have gen ed students that ranger from letter sounds all the way to multi-syllable words. 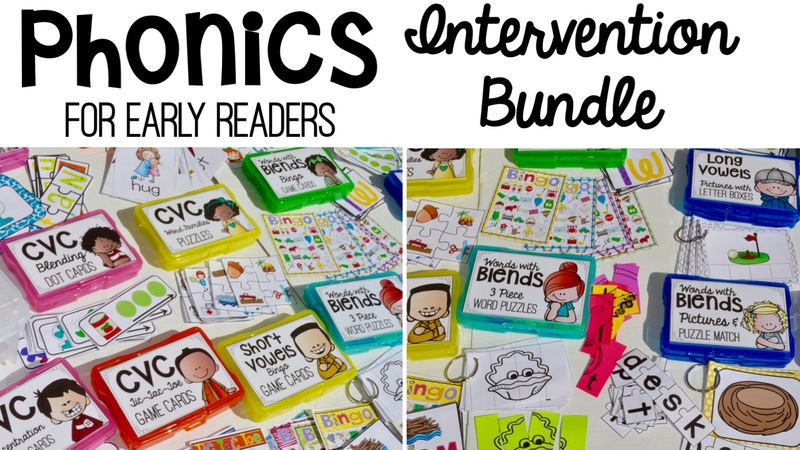 Which bundle would I get what I need most to work with my kiddos in a small intervention group? This is amazing! I can’t wait to use it with my niece who is struggling with cvc words! Thank you for making it available free!! !